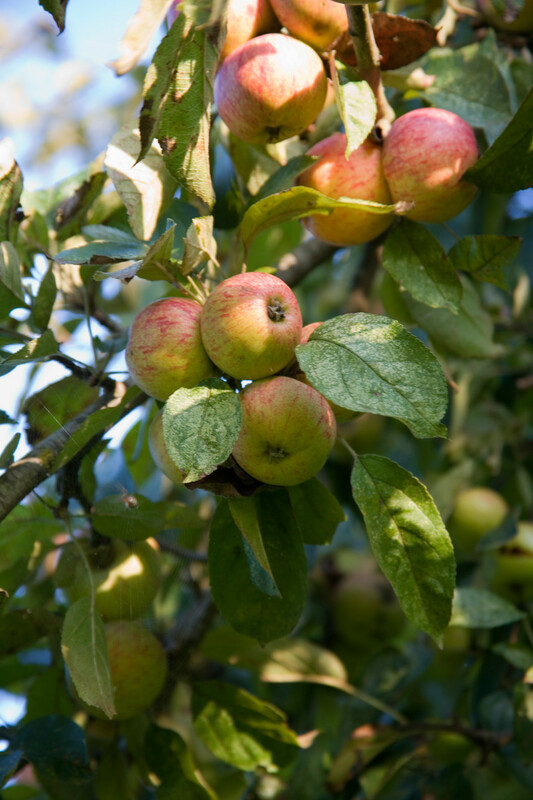 The name Claque-Pepin comes from a type of apple variety, which when ripe, rattles when shaken. The name translates to the seeds (pepin) which rattle (claque). The property is located in the Normandie region, nestled between the Domfrontais and the Pay d'Auge, in the 17th century farm next to the ancient chateau of Serans, formerly the family estate of the Louvet family. 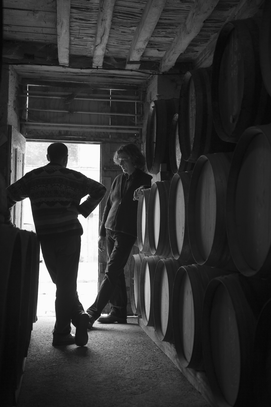 Claque-Pepin officially began 13 years ago. However, current owner Benoit Louvet has been immersed in the world of distilling and ageing for many years. 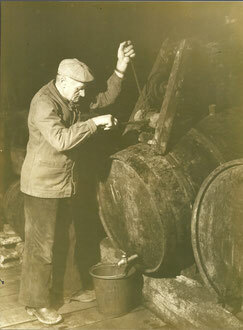 He began his "apprenticeship" fairly young with his grandfather Vital. 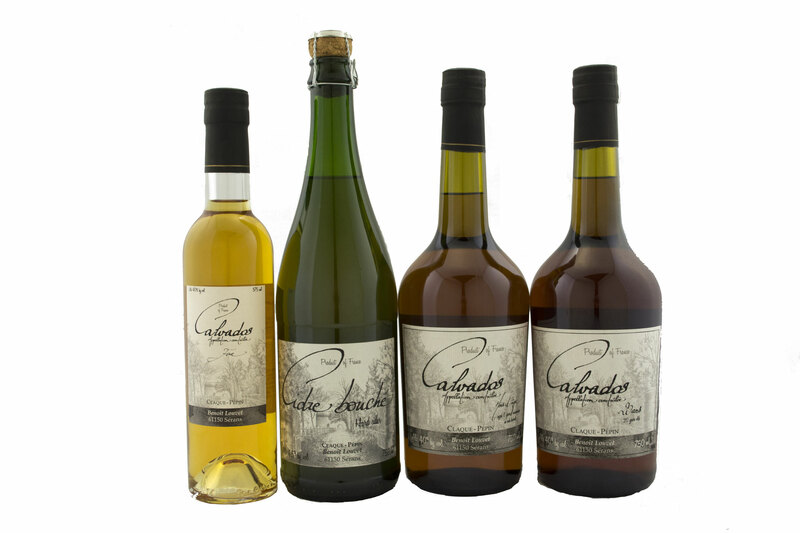 After working for a few other Calvados producers as cellar master, he decided to start his own artisanal production and perpetuate the art of making calvados and cider, while respecting the Normand tradition and the environment. Calvados is made from cider. Those farmers who are licensed to “boil,” travel from farm to farm with their vintage stills (alambics), distilling the cider into calvados. The cider enters the still through the heat exchanger in the upper region and descends tray by tray. The heat transforms the most volatile elements in the cider (water and esters) into vapor. This vapor then travels in the opposite direction, where it is concentrated with the alcohols, esters, and flavors. 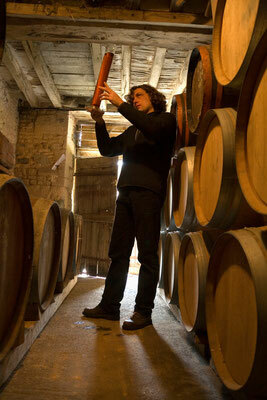 This is then concentrated in the smallest column from which the eau de vie emerges at 72%. 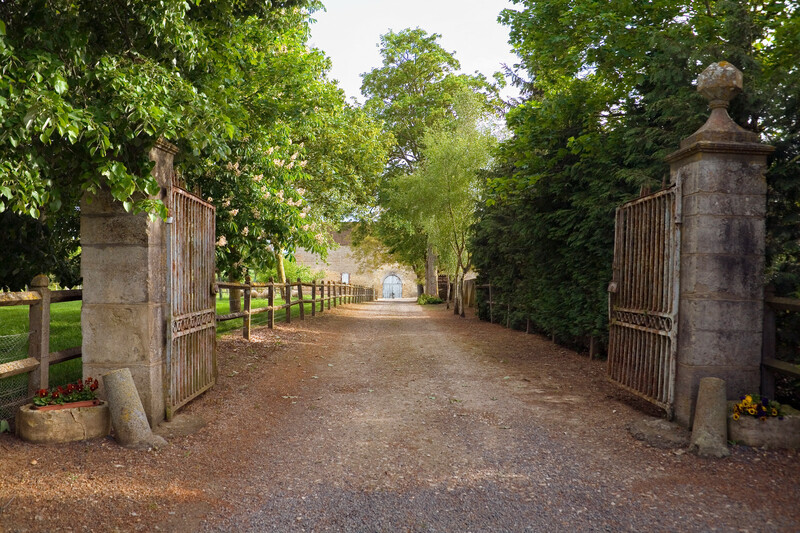 The property and orchards are ideally situated in the Calvados AOC, just in between Pays d’Auge and the Domfrontais, producing cider and Calvados with the round and refined flavors of Calvados of the Pays d’Auge and the spicier notes typical of Calvados of the Domfrontais. Benoit Louvet grows apples and pears but also buys from a few growers around, especially in the Domfrontais, an area he loves. 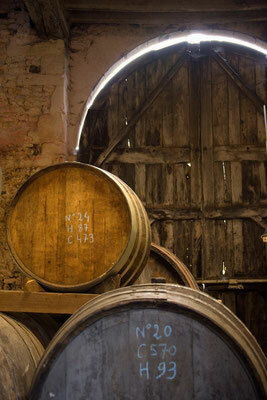 After he makes his cider, an itinerant distiller comes to the farm to distill Benoit’s ciders to his specifications. 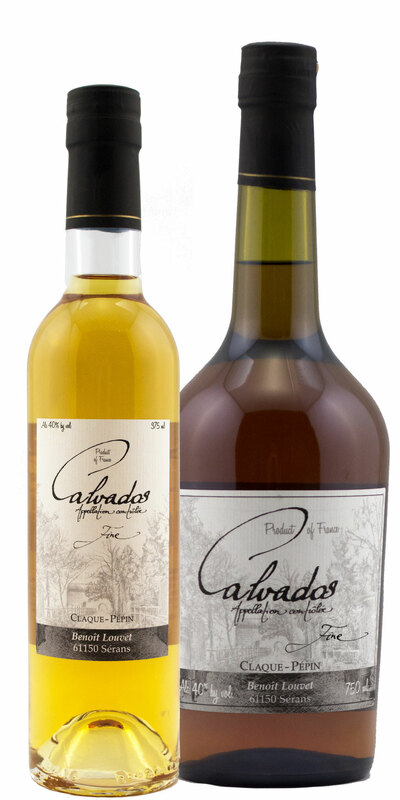 The young calvados are redolent with apple and pear, maintaining the subtle aromas of the fruits. The older calvados reveal flavors of orange blossom and candied fruit, as well as hints of balsamic spice, wood, cigar box, and chocolate. A young calvados with a golden hue, a pronounced aroma of apples, and a soft mouth feel. 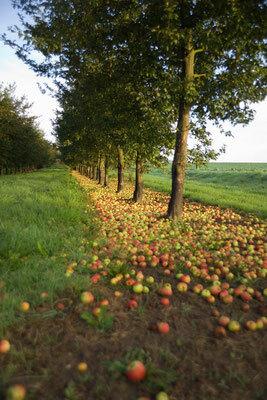 This quality is a blend of apples and pears which come mostly from the Domfrontais area. Ideal as an aperitif, mixed in cocktails, or for cooking. Available in both 375 mL and 750 mL. Claque-Pepin Calvados Hors d’Age is crafted from a blend of old calvados. Aromas of flowers on the nose with flavors of fruit, pear, and vanilla and a slight hint of oak on the palate with a long finish. 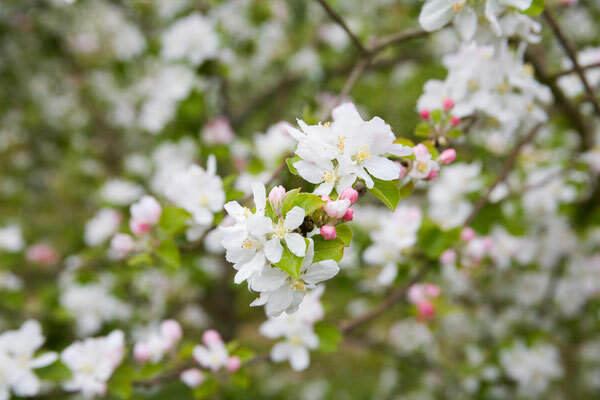 "Earth and fruit elements on the nose call to mind an apple orchard after a light rain. The flavors follow suit with a muskiness that blends with fresh apples. Gentle spice comes through with cinnamon and notes of zesty lemon peel." 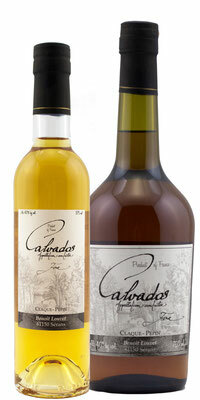 The first certified organic calvados available in the U.S. Average 6 years old. A pale yellow amber with a floral, fruity nose with aromas of iris and nuts. Herbaceous and vegetal on the palate. 92 points. Excellent. Highly Recommended. Claque-Pepin’s 20 Year Old Calvados presents a balanced aromatic finesse on the nose, with pear forward, wood, tobacco, spice, cinnamon and candied fruit. A remarkable smoothness on the palate with port, walnut, and wood. Best enjoyed as a digestif.